Update Barry: I just asked several people around the world if they see Google News and Google Local results in the middle of the Google Web Search results. They all have confirmed seeing it, except for one in the UK. Here are some test examples that should show in the middle of the page; myspace, white house, google news and Pennsylvania Engineering schools. This has already dramatically changed the number of visitors to those who are included in Google News or Google Local. A member on the SEO Refugee forums discovered that Google Onebox has expanded its application to show maps in expanded queries and that the placement of maps is in the center of the page, increasing visibility. This was also picked up on WebmasterWorld. Today, I noticed that Google Onebox/G maps has now been extended for organic searches with state names. It wasn't there yesterday. One thing that I believe is powerful about this is that as the onebox spreads other sources of advertising on the web, outside of Google become less effective. This is already making a huge impact on traffic to web sites. EarlPearl reports having "total traffic approached our highest daily numbers." In fact, he reports seeing over 80% more traffic from this change in one day. EarlPearl then commented at Mike Blumenthal's blog with the same search, which we used in our screen capture. 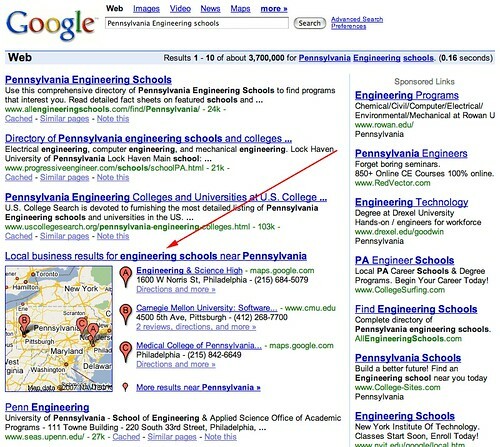 For example, a search on Pennsylvania Engineering schools brings up the Google onebox local result smack in the middle of the page. This is exactly what we reported with Google News results in the middle of Google web search results pages. In fact, then I (Barry) was only able to see it at home, but now I can see this at my office. So we can now find Google Local and Google News results in the middle of the page for searches that m ay trigger those types of results. I.e. Local results are triggered by regional searched (location + service) and News results are triggered by news types of searches (paris hilton happens to be in the news today). Forum discussion at SEO Refugee and WebmasterWorld.